I have to be totally honest. I was avoiding the Cinque Terre. I just didn't feel like I would like it that much. I can do the beach about once a year (Portugal's got me hooked), and I don't like heights. That's all the Cinque Terre appeared to be: steep hiking trails to rocky overcrowded beaches. I've seen colorful Italian cities. I've seen Californian coastline homes built on top of themselves. What could the Cinque Terre really have to offer aside from too many tourists? It helped that I had just read a random book laying on the shelf at our AirBnB in Seville called Beautiful Ruins . It was about a fictional forgotten village next to the Cinque Terre, and it took me over to Florence, up to Scotland, back to my old haunts in Los Angeles, and even north to Idaho. I recommend it if you like Hollywood mystique (Elizabeth Taylor and Richard Burton!) and how lives can twist and turn around and back to each other. Anyway, I only had time to go to one of the Cinque Terre villages before catching my flight back to Munich out of Pisa. Karen, Maggie, and I elected to go to Vernazza. Now, I have no other Cinque Terre villages to compare Vernazza to, but I am really glad we chose it! I am also thoroughly satisfied that we took the trains instead of hiking. I can hack a hike, but muddy trails on the side of cliffs just do not add up to my kind of fun. The trains are super easy once you reach La Spezia. All of the Cinque Terre villages are on the same line to Levanto and you just get off on the one you want to go to. There is also a ferry. It is larger than the boat pictured. 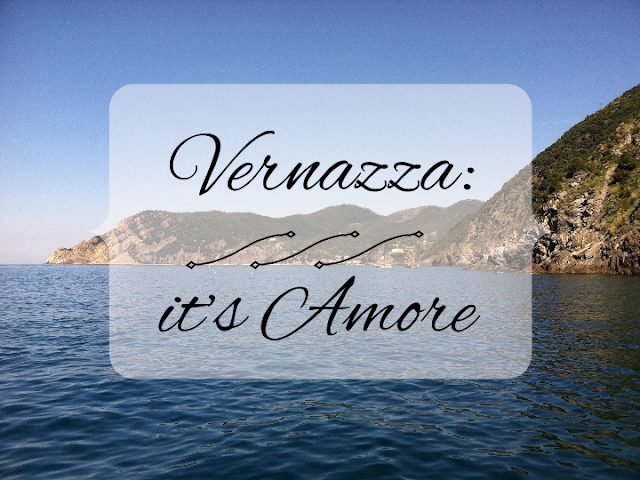 As soon as we stepped outside of the Vernazza stazione, I saw what I had been missing out on. The building colors were deeply saturated against the blue sky. Every inch of this place is adorable. We walked past rainbow umbrellas shading cafe-goers on our way to the marina area. Vernazza is breathtaking. This colorful village rises up out of the cove and the hills behind it are covered with lush green vineyards and trees. We climbed up to the lookout tower (small fee of €1,50) and saw where we wanted to go eat lunch - on the other mountain. This decision led us up the "streets" of Vernazza, which are really just tons of stairs that go in every direction and you hope it isn't a dead end! We ate our pasta with this view overlooking the Mediterranean. It was perfect. I am SO GLAD Maggie wanted to go to the Cinque Terre, or else I don't know when I would have ever gone on my own! Now I can't wait to return to explore the other towns, along with other Italian coastal areas. Lucky for me, our location in southeast Germany puts us just a quick flight away! *Disclaimer: I enjoyed writing this post way too much while listening to Dean Martin songs. Also, Beautiful Ruins (I'm rating it "R" for language and sensuality, but it is not constant or bombarding) is available through an Amazon affiliate link. If purchased, I will receive a small percentage of the profit. Have you found the Cinque Terre authentic or touristy? Which of the "five lands" is your favorite and why?